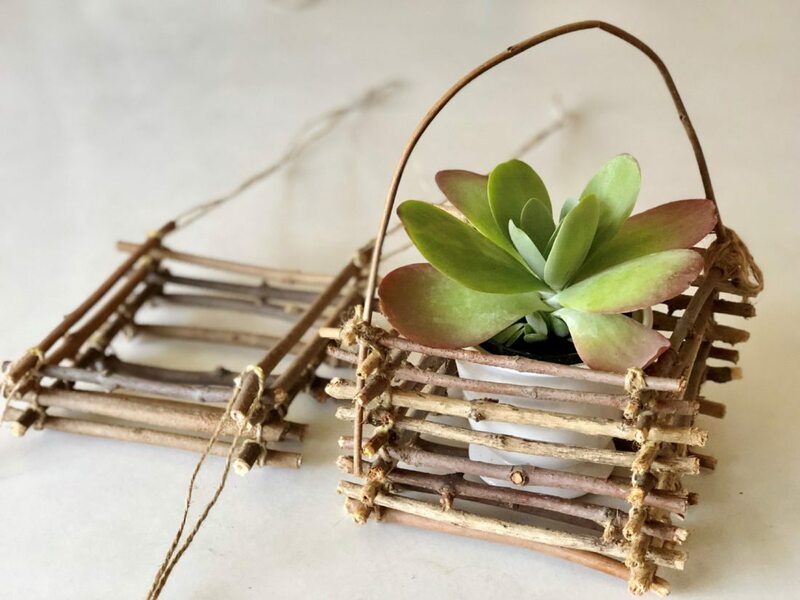 Courtesy photo of a twig basket. Want to make one? * Arrange four sticks into a square on a newspaper-covered table or counter, with a 1-inch overlap at each corner. Dab nontoxic wood glue or glue from a glue gun at each corner. * Tie each corner with a 4-foot piece of twine. Knot it in the middle and let the long ends dangle. * To make the bottom of the basket, glue three twigs in a row 1 inch apart to the square base. Secure each twig to the base with a 1-foot twine piece. Trim excess. * Dab glue on the twine at each corner. Lay four sticks in a square, log-cabin style, then tie corners as before. Continue layering and tying until you’ve used all of the 7-inch sticks. * Bend the 18-inch stick to make a handle. Secure at opposite corners with glue and twine. Tie excess twine into a small bow. * Set your favorite growing plant inside. Donna Erickson’s award-winning series “Donna’s Day” is airing on public television nationwide.